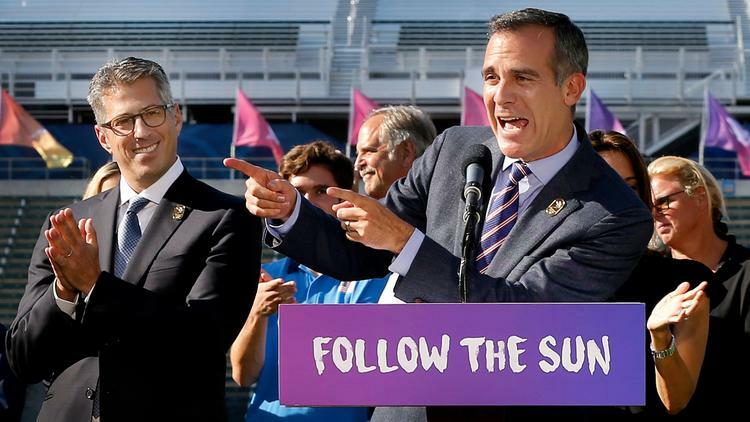 Los Angeles Mayor Eric Garcetti claimed the 2028 Olympic and Paralympic Games will help take the Olympic Movement into a new generation as their delegation departed for the International Olympic Committee (IOC) Session. Los Angeles is due to be formally awarded the 2028 Games by the IOC at its Session on Wednesday (September 13), with Paris given 2024. It will mean Los Angeles will become only the second city to host the Olympic Games three times, having previously staged them in 1932 and 1984. It was agreed at the Extraordinary IOC Session in Lausanne in July that a Tripartite Commission would be formed consisting of representatives from the IOC and both prospective host cities. Los Angeles then announced its candidacy for the 2028 Games, leaving the path clear for Paris to host the earlier edition. “This is the moment Angelenos have been waiting for since we began our work to bring the Games back to Los Angeles,” said Garcetti. “Today, Los Angeles 2028 is taking the final step in our bid, and preparing to begin our 11-year journey as an Olympic Host City. Los Angeles 2028 are scheduled to make their final presentation to IOC members on Wednesday. They promise their plan will help create a “new Games for a new era”. They claim the presentation will harness the city’s unparalleled creative and storytelling assets to deliver the Olympics in a low-risk, fiscally responsible and sustainable way. Los Angeles 2028 will receive concessions from the IOC for hosting the later event. They will also be exempt from other payments and will retain the option of selling domestic sponsorship in categories not covered by the IOC. Last week, it was confirmed that California would provide up to $270 million in guarantees if Los Angeles 2028 goes over budget under new legislation. Last year, California had promised similar guarantees but that covered only the 2024 Olympic and Paralympic Games. Los Angeles 2028 are set to be represented by their chairman Casey Wasserman, chief executive Gene Sykes and vice-chair Janet Evans in Lima. “Everyone connected to LA 2028 is thrilled to be part of this win-win-win scenario for the Olympic Movement,” said Wasserman. “Every step of the way, Olympic Agenda 2020’s principles of sustainability, responsibility and youth engagement have been our guiding stars. “That philosophy means we are ready to serve the Olympic and Paralympic Movements and the people of Los Angeles for the next 11 years. American IOC members Anita DeFrantz, Larry Probst and Angela Ruggiero will also be present in Lima, along with United States Olympic Committee chief executive Scott Blackmun. Olympic champions and Los Angeles 2028 Athletes’ Advisory commission members Allyson Felix and Michael Johnson will also be present.